Copper for delivery in September jumped to a high of 2.8540 a pound ($6,292 tonne) in early afternoon trade, up 4.3% on yesterday's close to the highest since mid-May 2015. Copper's 2017 year to date gains in percentage terms now top 13% and the red metal is trading 28% higher than this time last year. Another sign that primary copper supply is tightening treatment and refining charges levied by smelters for concentrate are declining. TC/RCs paid by mining companies are a good indication of conditions in the spot market and rates have now fallen by 10% from the start of the year to around $80 a tonne and are well below the price floor set by China's major refiners for the third quarter. Supply disruptions at some of the world's biggest mines including BHP's Escondida mine in Chile earlier this year and ongoing strike action at Freeport McMoRan's Grasberg operations in Indonesia are also boosting the price. Workers at Grasberg last week extended their strike for a fourth month to end August. Freeport's temporary exporting licence is coming up for renewal in October, a bargaining chip used by Jakarta as it negotiates with the Phoenix-based company about divesting a majority stake in its Indonesian subsidiary. Shares in Freeport jumped more than 15% to a 16-month high on Tuesday after the $21.5 billion company announced revenues that topped estimates and progress on talks with the Indonesian government. Grasberg was forecast to produce 680,000 tonnes of copper this year making it the world's second largest copper mine after Escondida. 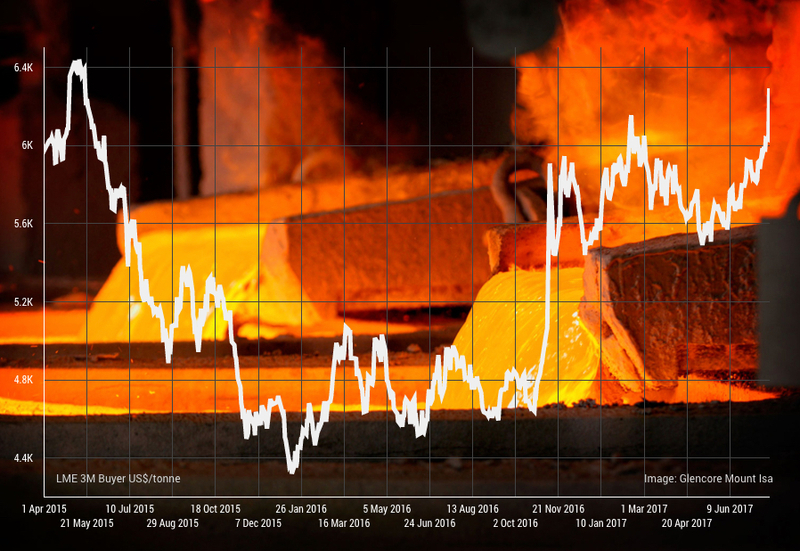 Copper mining companies were trading higher across the board on Tuesday with world number three producer Glencore rising 4% in London trading. Diversified giants BHP gained 3.7% in New York trading and Rio Tinto received a 5% bump. Gains were more modest for Southern Copper Corp, Anglo American units trading in New York jumped 5.8% and Poland's KGHM jumped 4.4%.